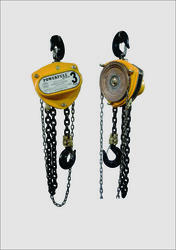 Our range of products include spark proof chain pulley block-1t x 3mtrs lift, non spark chain pulley block cap. 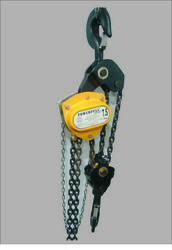 5t x 3mtrs lift, spark proof chain pulley block. - 2ton x 3mtrs, spark proof chain pulley block 3ton x 3mtrs, overload protection device and non spark chain pulley block 7.5t x 3mtrs lift. We are engaged in manufacturing an extensive range of Spark-Proof Chain Pulley Block that is appreciated by the clients for their distinctive features like stability, consistency, compact design, spark resistance and large capacity. These are available in various sizes and specifications, at the most competitive prices. These are used in petroleum refineries, chemical plants, polyester plant etc. 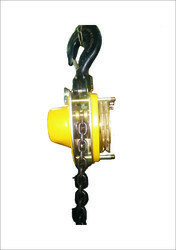 Some components like load chain wheel, hand chain wheel, chain guide etc. are made of non-ferrous material. Non-Spark (Spark Proof) Chain pulley Blocks for Petrochemical haphazardness areas. Capacity - 3t X 3mtrs Lift. The Hoist Overload Limiter / Overload Protection Device protects the hoist mechanism from damage due to overloading. When an overload is applied to the hoist, the overload limiter actuates to stop lifting. Capacity - 7.5Ton x 3mtrs Lift.